BUENOS AIRES, Argentina (CNN) -- In 1982, they were young men serving their obligatory military service -- Argentine conscripts who fought against the British that year during the Falklands War. More than 25 years later, many of those former combatants are in a legal battle against their former officers, alleging torture, starvation and murder at the hands of their own military. 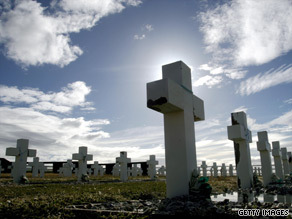 An Argentine war cemetery near Darwin, Falklands. A lawsuit alleges officers killed some soldiers. A federal judge in the southernmost province of Tierra del Fuego, which under Argentine law claims jurisdiction over the Falkland Islands, recently ruled that the officers were responsible for crimes against humanity and human rights abuses. The testimony presented to Judge Lilian Herraez included accounts of a soldier who was shot to death by a corporal, four soldiers who starved to death, and 15 alleged cases of torture in which conscripts were staked to the ground as punishment, according to Argentine media reports. The Falkland Islands are a British territory located 670 miles (1,000 kilometers) from the coast of Argentina. Argentina has claimed sovereignty over the islands since they were occupied by the British in 1833. The collective lawsuit by some 23 former conscripts garnered attention in a country that is divided over how to apply justice to the acts of the so-called Dirty War of the late 1970s and early 1980s, during which an estimated 9,000 to 30,000 people "disappeared" under a military dictatorship. Argentina's loss in the Falklands War is credited in part with creating the movement that ended military rule. A contentious point of the national debate is whether to prosecute former military officers. A long-standing law providing amnesty to former officers was repealed in 2001. Against this backdrop came the ruling of Herraez, who considered the lawsuit that combined 80 allegations of human rights violations. She found the cases constituted crimes against humanity. Attorneys for the more than 70 officers and noncommissioned officers named in the lawsuit immediately appealed. They argue that a military court, not a civil court, should hear the case. "This is a regrettable and interesting case," Argentine legal analyst Ricardo Monner Sanz told CNN en Español. "I say regrettable because it would've been the best if it never had happened. Interesting, because it is a new look at the horrors that everyone knew Argentinean soldiers suffered, not at the hands of the British, but at the hands of their superiors." Ernesto Alonso, who fought in the Falklands War as a conscript, said he witnessed many such abuses. "Those who were supposed to protect us were in many cases our own executioners," Alonso told CNN en Español. "It was inconceivable that we denounce murders, torture and humiliation knowing that we were at war with a real enemy like the British." The case is the biggest, but not the first that has levied accusations of human rights abuses against conscripts who fought in the Falklands War. In February, another federal judge ruled that the case of a soldier who had been staked to the ground at a military base in the days leading up the war was an act of torture and an abuse of his human rights, the Clarin newspaper reported.